With immense experience in this line of work, our company has gained expertise in manufacturing, supplying and wholesaling a wide range of tiles . 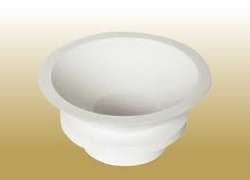 - Ceramic cloth metallic and non metallic 2 mm and 3 mm thick. - All temperature resistance upto 1260 deg. C.
We offer an assortment of qualitative Ceramic Mugs that are widely used for household and promotional purposes. We make use of qualitative material to design these mugs that ensures durability and high resistance against heat .These crack-free mugs are available in a plethora of colors, designs and can be availed various shapes and sizes desired by the client. Krishna Ceramics has established itself in the highly competitive market as a renowned ceramics jar manufacturing company. An assortment of ceramics jar is specially carved by our professionals keeping in mind the diverse requirements of our esteemed clients. We are engaged in manufacturing and exporting a wide range of Ceramics Jar which is available with us in attractive designs and patterns. Pens, Knives, Mugs, Water Bottles, Key Rings and More Whether you are looking for an inexpensive give-away item for a promotion or a first-class premium gift as a customer thank-you, we can help you find just the right promotional product at the right price.